Jadavpur University Admit Card 2019 - Jadavpur University will release the admit card of Jadavpur University 2019 for UG and PG courses in the online mode. Candidates will be able to access their Jadavpur University 2019 admit card upon the successful remittance of application fees. 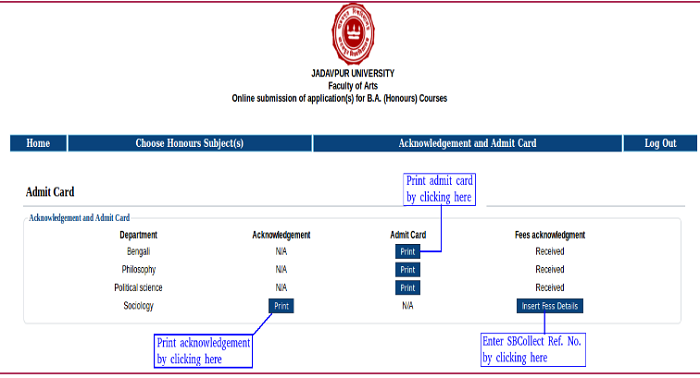 As Jadavpur University’s system of generating admit card is different, candidates can refer to a pictorial representation of the steps to download it given in the page. Candidates should note that they will not be sent the Jadavpur University admit card 2019 by post by the university; therefore, they will have to download it in the online mode themselves. On the admit card of Jadavpur University 2019, candidates will find the following details mentioned - candidates’ full name, their roll number and application number, the subject they are appearing for, and the venue and time of the examination. After downloading the admit card, candidates should take a few print outs of it as well. Since the Jadavpur University 2019 admit card serves to be an extremely important documents, it is advisable that candidates retain the admit card till the time of admission. It is mandatory for candidates to carry their admit cards along with valid identity proofs on the examination day, as they will be asked to furnish these documents in the exam centre for verification purposes. Applicants should note that they will be able to download Jadavpur University admit card 2019 only when they successfully submit the application form with all the requisite documents and application fees. Therefore, it is important for candidates to fill the application form of Jadavpur University and submit the fees within the stipulated deadlines. Jadavpur University conducts admissions every year for candidates who seek to get into the university for its prestigious undergraduate and postgraduate courses. Jadavpur University admission 2019 will be conducted for those candidates who want to enrol themselves in the session starting from 2019 for UG and PG courses. The dates of application and entrance tests will vary as per different programmes. For more information related to admit card of Jadavpur University 2019 like application dates, examination dates, steps to download admit card, exam day instructions, and so on, candidates can read below. Given in the table below are important dates related to the issue of admit card. Since, the admit card will be generated only upon the remittance of application fees, candidates will find the application deadlines for different courses below. Moreover, the entrance examination dates will help candidates to be on their toes and be ready with important documents well in advance. Last date of online application for B.Ed. Following are the steps with the help of which candidates can download admit card of Jadavpur University 2019 easily. Firstly, candidates will have to complete application form by providing all the requisite details and upload all the documents. Candidates will then have to remit the application fees in the online mode using any of the methods - debit card/credit card/netbanking. The online fee payment procedure will be processed by SBI I-collect system. After payment of fees, candidates will have to upload the SBI collect reference number and click on ‘submit’. This marks the end of the application process. 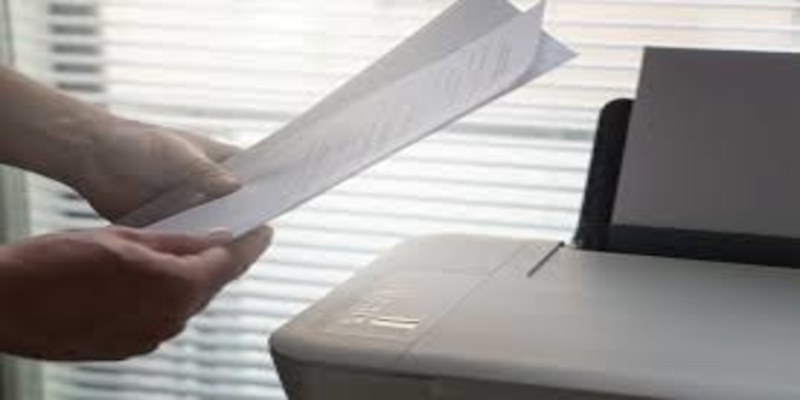 A payment receipt will be generated which the candidates will have to download and take a printout of. Upon the successful payment of fees, candidates will be able to download their Jadavpur University admit card 2019. To download the admit card, candidates can login to their registered accounts using their login credentials. Upon logging in, candidates will find a window similar to the one given below. As can be implied from the above picture, candidates will have to click on the corresponding ‘print’ buttons for each course. After downloading the Jadavpur University 2019 admit card, candidates are required to take at least three to four printouts of it and retain them for further references. On the examination day, candidates will have to furnish two copies of their admit card affixed by their passport size photographs. Alongside, a valid identity proof also needs to be carried along with the admit card. Candidates will find the following details mentioned on their admit cards. It is advised that candidates go through all the important details given in the admit card and check if they are correct or not. In case, candidates find any discrepancies on the admit card of Jadavpur University 2019, they should immediately report their grievances to the university officials and get them resolved at the earliest. Unlike other universities, Jadavpur University processes the admit card right after the candidate has successfully remitted the fees. So, candidates should ensure that they submit the complete application form and remit the fees within the given deadlines to access the admit card of Jadavpur University 2019. Candidates should not forget to carry at least two copies of their admit cards along with passport size colour photographs affixed on them on the day of examination. In addition to the Jadavpur University 2019 admit card, candidates should also carry their valid identity proof to the examination centre. If unable to furnish these documents, candidates will not be allowed to write the test. Candidates should note the day and time of the examination mentioned on Jadavpur University admit card 2019. They should report to the examination hall at least an hour before the exam is scheduled to take place. In case of any discrepancies in the admit card, candidates should immediately get in touch with the university officials and get the issue resolved as soon as possible. Q. When will candidates be able to access their admit card of Jadavpur University 2019? A. Candidates will be able to access their admit card right after they have remitted the application fees and submitted the complete online application form. Q. What mode will the candidates be able to access Jadavpur University admit card 2019? A. The admit card will be available in the online mode. Candidates will not be sent their admit cards by post. Q. How can candidates download Jadavpur 2019 admit card? A. Candidates will be required to login to their account (created at the time of registration). Upon logging in, candidates will find the list of subjects they have applied for and their corresponding links to admit card. They will have to click on these link to download their admit cards. Q. How many copies of admit card of Jadavpur University 2019 do candidates need to carry on the day of examination? A. Candidates will be required to carry two copies of their admit card on the day of the examination. Q. What all does a candidate have to carry along with Jadavpur University admit card 2019 on the day of examination? A. Candidates should make sure that they carry two copies of the admit card with their passport size colour photographs affixed on each. Along with these, test takers will also to carry their valid identity proofs on the day of exam. Q. What if a candidate finds an error in Jadavpur University 2019 admit card? A. Candidates should immediately report the errors to the university officials as soon as possible. Therefore, it is advised that candidates complete the application process and pay the fees much in advance so that they have ample time to resolve the issue. I'm from West Bengal and I'm SC. so how much number I need in wbjee to get jadavpur university in cse department..,?? Can I get admission By marks in b.com? From when will the admission start for MSC 2019? Your JADUNIV brochure has been successfully mailed to your registered email id .